A little bubbly goes with everything. 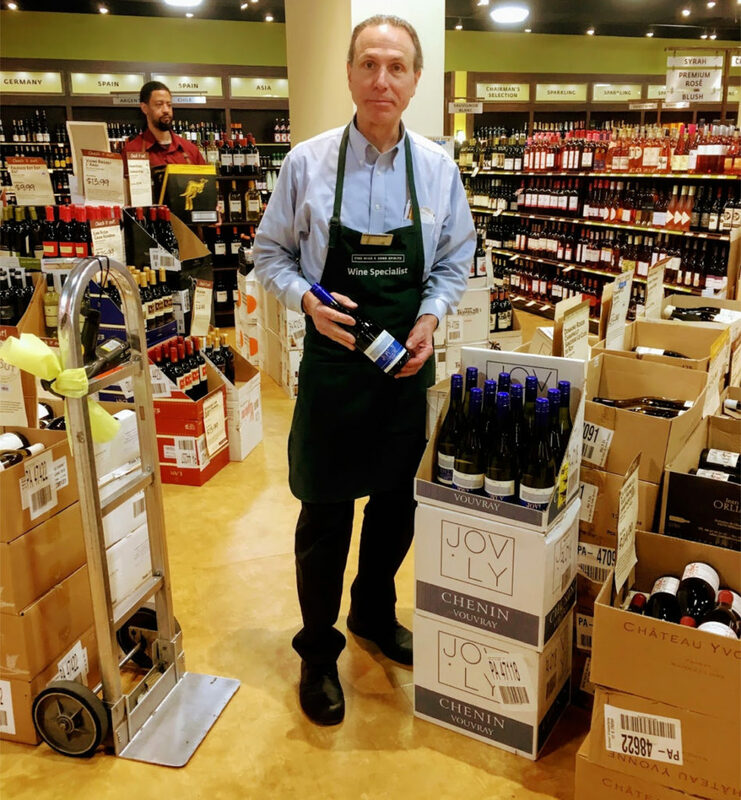 There are many varieties of sparkling wine, but Rob recommends sparkling wines from California, Prosecco from Italy or the classic: champagne from France. Chocolate is always a winner. When you give a box of Russell Stover, Ghiradelli chocolate or Hershey’s Hugs and Kisses, know they taste a little sweeter because they are made with love by talented UFCW members. Making chocolates is an art form, one your Valentine is sure to love. Feel a bit lost in the floral department? Our members work as florists in grocery stores across the country and are happy to help you put together a bouquet. And if you are a UFCW member yourself, remember you can save 25% on flowers from Teleflora year round. Your 25% discount should be applied automatically. If you encounter any issues accessing your 25% discount, simply type BAAUP25 in the Promotion Code box during checkout. 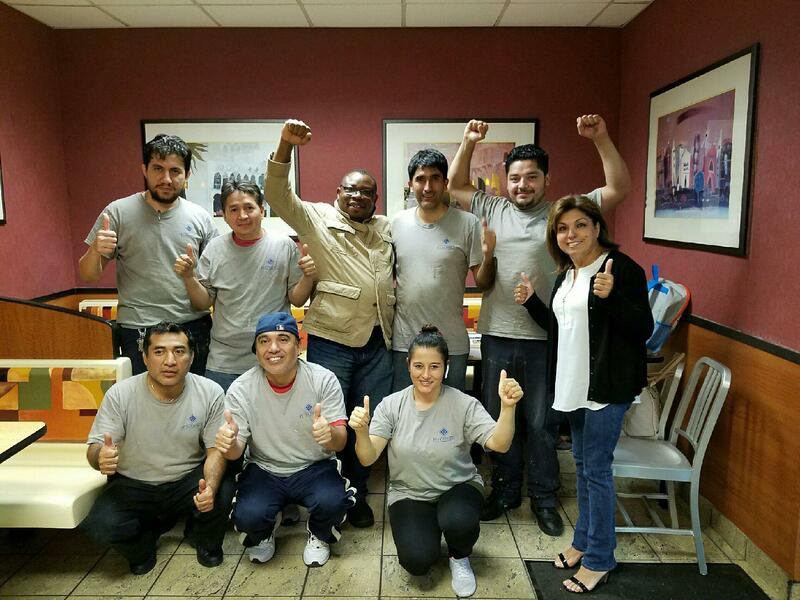 On Nov. 10, 15 maintenance workers employed at Colonnade Apartments in Newark, N.J., voted overwhelmingly to join RWDSU/UFCW Local 108. The hardworking men and women were concerned about low pay, health and safety issues, and the lack of retirement benefits. Workers were also concerned about being paid for all of the hours they worked. 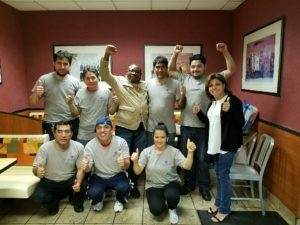 “Most importantly, these workers weren’t being treated with any respect, and they wanted to change that,” said RWDSU/UFCW Local 108 President Charles N. Hall, Jr. This month, workers at Ardent Mills, a food company in Chattanooga, Tenn., chose a union voice and a better life with UFCW Local 1995. Ardent Mills workers produce flour for breading for fried foods, cakes and pies eaten in restaurants across the country. Workers at Ardent Mills have suffered through cutbacks and reductions in benefits due to a corporate acquisition three years ago with no way to have a voice in the direction of their company. Now, workers at Ardent Mills will have the opportunity to negotiate an agreement that will help them address issues at work, raise wages and benefits, and get the respect they deserve. A new report from the Economic Policy Institute (EPI) shows that the declining rate of union membership is costing nonunion workers $133 billion annually in lost wages. This massive sum – which is more than the economic hit workers take when we enter into unfair trade agreements with low-wage countries – is a key reason why hardworking Americans are struggling with stagnant wages and inequality. EPI found that by establishing pay and benefit standards, unions boost wages for all workers. In fact, if union density in 2013 was as high as it was in 1979, nonunion private sector men would have earned an extra $52 each week. This is the first study providing a broad estimate of the wage decline for nonunion workers as a result of the erosion of unions. This report should also remind us that the benefits of a union contract goes beyond wages. Earlier this year Oxfam America published a report titled No Relief: Denial of Bathroom Breaks in the Poultry Industry, which documented the union difference when it comes to workplace rights and safety. This shocking study found that nonunion workers wore diapers when denied bathroom breaks by irresponsible employers. Also, a union contract is often the only way women can earn equal pay for equal work and, in some states, the only line of defense for all workers facing workplace discrimination. Finally, according to the Center for Economic Policy and Research, black union workers experience higher wages and better access to health insurance and retirement benefits than their non-union peers. (l to r) Local 1102 Rep. Mayra Valladares, Elsa Barrera, and Local 1102 Rep. Jeff Guardado. The RWDSU/UFCW is part of the New York Union Child Care Coalition, a group of unions that developed and promoted the Child Care Facilitated Enrollment Project to help provide affordable child care for working families in the state. By working with New York State Senators Jeff Klein and Diane Savino, the RWDSU/UFCW was instrumental in helping to establish the program. And RWDSU/UFCW members are starting to benefit. Elsa Barrera is a Local 1102 member and a mother of three. On top of her dedication to raising her three children, Elsa also works full-time at Flying Foods – an airplane food service supplier – at JFK airport. Barrera has received a grant from the program, and will be able to send two of her children to a camp program for the summer at nearly no cost. This support will help Elsa make ends meet and help her children receive the care and security they deserve. Other RWDSU/UFCW members at Macy’s and H&M have also seen their child care costs drastically reduced thanks to the program. 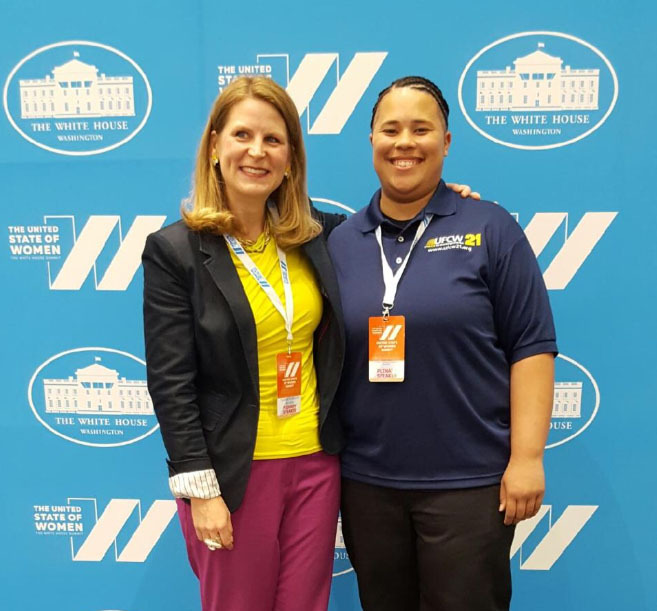 Ariana Davis, a UFCW Local 21 member who works at Safeway, spoke at the White House United State of Women Summit in Washington, D.C. She shared the stage with President Barack Obama, First Lady Michelle Obama, Vice President Joe Biden, actress Kerry Washington and Oprah to discuss key gender equality issues. 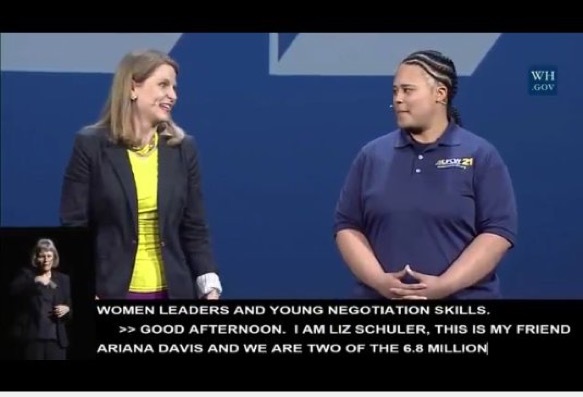 Ariana presented with AFL-CIO Secretary-Treasurer Liz Shuler about the best way to give working women equal pay and an equal say – a union. Equal pay, fair schedules, paid leave – the bottom line is that if we stand together and negotiate together, we win together. Evidence shows that union membership increases wages for all workers, but women experience especially large advantages. Women are the primary breadwinners in 38% of American households – paying them less for no reason puts millions of families and communities at a disadvantage. 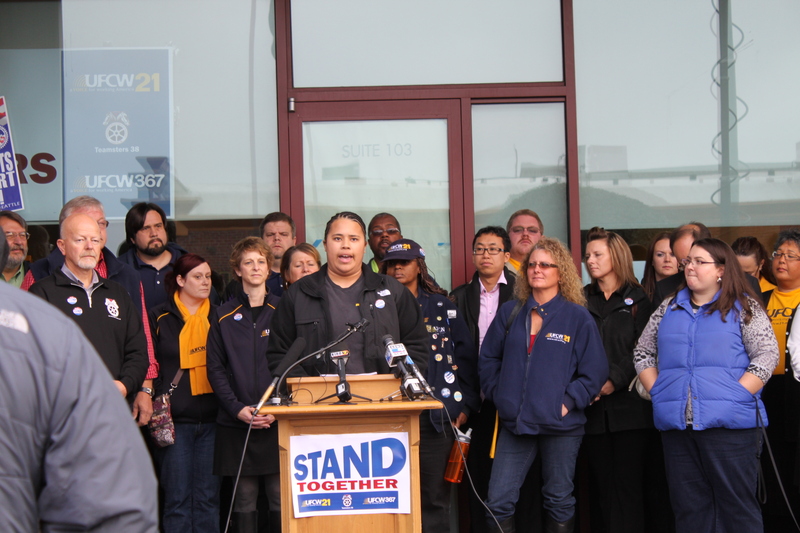 Back in the other Washington, Ariana has been busy collecting thousands of signatures as the citizen petitioner behind Initiative 1433, a statewide ballot measure which will raise the minimum wage to $13.50 and provide workers with up to seven days of paid sick leave. 6.8 million women in America belong to a union. Thanks to Ariana, more people know why. A new report by the Center for American Progress underscores the uneven access to paid leave and fair schedules in the American workforce and the need for legislation to address these issues. Titled Who Gets Time Off? 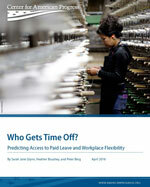 Predicting Access to Paid Leave and Workplace Flexibility, the report examines the schism between workers in higher paid jobs, who are more likely to have benefits such as paid leave and workplace flexibility, to lower- and middle-income workers, who are less likely to have access to these benefits. According to the report, nearly 40 million workers, or 39 percent of the workforce, still lack access to even a single paid sick day. In particular, hourly workers, workers with jobs in the service industry, and Latino workers are less likely to have access to paid sick days and other workplace benefits. Conversely, older workers, full-time workers, and workers with higher earnings are more likely to have access to employer provided paid sick days, workplace flexibility and predictable schedules. More needs to be done to address the huge swath of American workers who are at the mercy of their employers and at risk of losing wages or being fired if they need time off to recover from an illness or care for a family member. While legislation has been introduced to address access to paid leave and workplace flexibility, it is still too slow and uneven to affect the majority of working families. Since 2002, only three states have passed laws to provide workers with access to paid family leave; 23 cities and five states have guaranteed workers the right to earned sick leave; and one city and one state have implemented policies to ensure that workers have access to fair schedules. 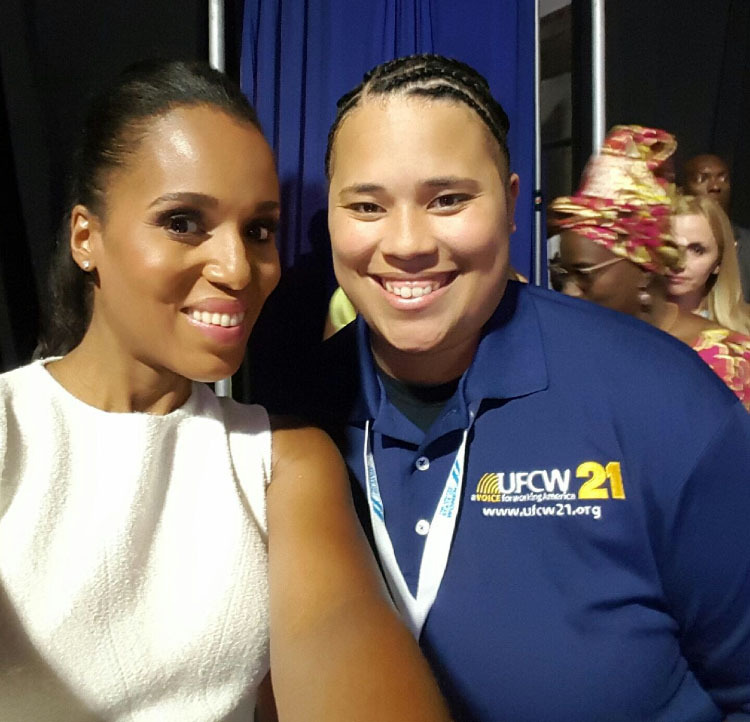 UFCW announces 100 organizing wins in roughly 100 days in 2016. 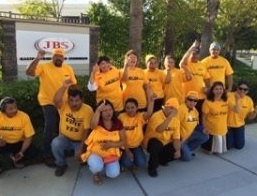 Washington, D.C. –Today, the United Food and Commercial Workers International Union (UFCW), America’s largest private sector labor union, announced its 100th organizing campaign win of 2016. UFCW’s 100 wins in 100 days reflects the frustration felt by hard-working people across this country. The economic pressure felt by working Americans is higher than ever and more and more of them are looking to unions for relief. Wealth inequality has become a dominant issue in this year’s Presidential primaries. In both parties, large crowds of voters assembled for candidates campaigning on a message of economic populism. 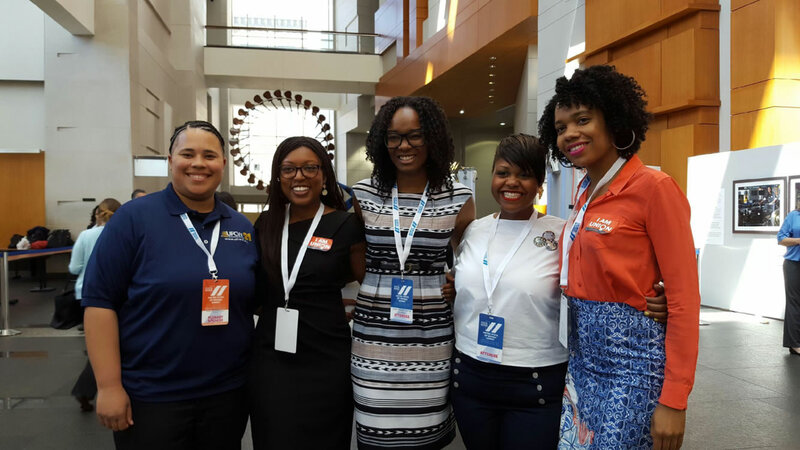 Concurrently, UFCW field organizers saw that same enthusiasm cross over into their campaigns. 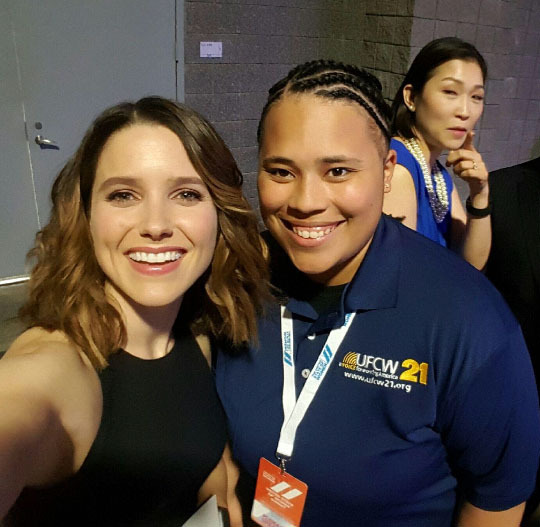 Increased attention to wages and inequality has motivated people to become UFCW members. Workers in 26 out of 50 states have already joined UFCW this year. 55 percent of adults under 30 hold a favorable view of unions (Pew). 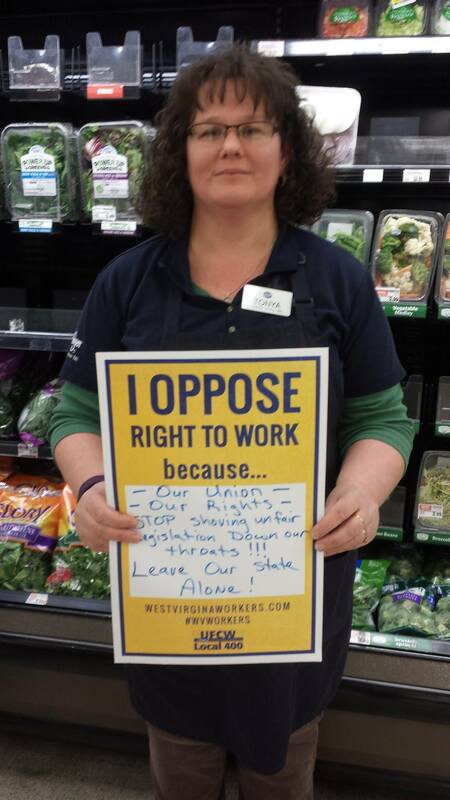 WASHINGTON, D.C. — Marc Perrone, International President of the United Food and Commercial Workers Union (UFCW), the largest private sector union in the nation, made the following statement about the West Virginia Legislature overriding Governor Tomblin’s veto to pass a “right to work” law. “The West Virginia State Legislators who supported passing this bill are telling West Virginians one thing – you have the “right to work for less.” Simply put, they should all be ashamed of themselves. Rather than helping the hard-working people of their state find good jobs that pay higher wages and provide better benefits, they have chosen to pursue a radical agenda that will devastate countless West Virginia workers and their families. “Instead of helping raise wages, State Legislators have passed a bill that guarantees lower wages, fewer benefits and more dangerous workplaces. Make no mistake, this only serves to reward irresponsible companies who will do everything they can to pay their workers less. This is true in every state that has passed “right to work” and will sadly be true in West Virginia as well.